At the finish of the Armstrong Galloway Hills Rally, and Jock and Paula win the MSA ARR Craib Scottish Rally Championship for the second year running. Above: the Subaru Impreza which took Jock Armstrong and Paula Swinscoe to victory on the Armstrong Galloway Hills Rally, the final round of the MSA ARR Craib Scottish Rally Championship. The win gave the crew their second Scottish Championship title. Congratulations to Jock and Paula. Commiserations to Garry Pearson and co-driver Robbie Mitchell, who only had to finish third to take the Scottish title. Jock was leading the rally after stage five when the engine manifold broke and melted the rocker cover in Pearson's M-Sport Ford Fiesta R5. The pair had had a good battle all year, but it was Armstrong's Subaru which finally came out on top. Mike Faulkner and Peter Foy finished second and Mark McCulloch and Michael Hendry took third podium spot. Thanks to all the organisers and competitors for a great day out. Getting the Holy Socks on for the Armstrong Galloway Hills. Whirling Wheels on one foot and the Angel on the other. No spare wheel on the Ezekiel socks. Photo from LindsayPhotoSport More photos here. Showing off his Holy Socks before the start of the rally, Jock is sporting a combination of The Whirling Wheels (cycle version) and The Healing Leaves. Co-driver Paul and the rest of the team got a whole pair of The Healing Leaves. The pair (Jock and Paul and their socks) finshed fifth overall and third of the MSA ARR Craib Scottish Championship runners. The Championship will be decided at the Armstrong Galloway Hills Rally in September in Castle Douglas. 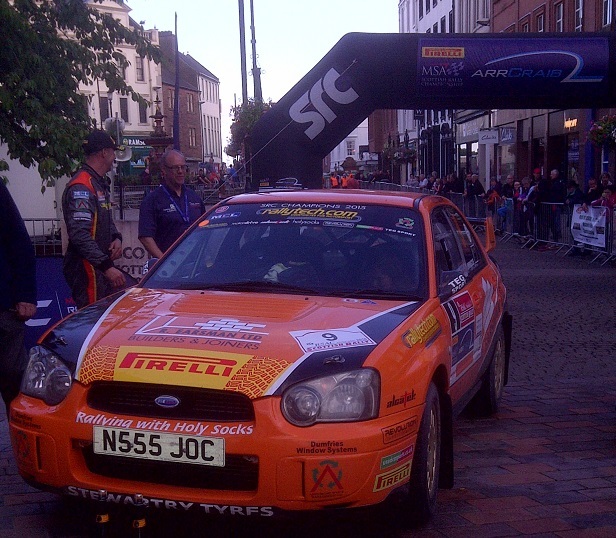 Second on the RSAC Scottish Rally in Dumfries. Back under the MSA ARR Craib Scottish Championship Arch in Dumfries town centre. Second spot at the MacDonald and Monroe Speyside Stages. Jock and Paula took the second podium spot in Elgin to add to their points tally in the defence of their MSA ARR Craib Scottish Rally Championship. The pair were first through the first of two Cooper Park stages but a spin on the second stage dropped them down the leader board. A second place gives them good points for the overall Championship. Stage one round Cooper Park in Elgin and they're on their way to the fastest time - with the ruins of Elgin Cathedral in the background. Paula has some fruit fuel at service. Must have been muddy on the stages and Joe gives the stickers a clean. Jock's boots are clean - hope his Holy Socks are too. The Earsman van - Joe's domain. Border Counties win for Jock and Paula. Jock Armstrong and Paula Swinscoe, brought the Earsman Subaru home in first place on the Brick and Steel Border Counties Rally on Saturday. Never a rally that has been kind to Jock, it was a particular pleasure to see them piped up to the ceremonial finish beside Jedburgh Abbey. I hope the Holy Celebration Socks gave them the extra inspiration that was needed on the day. We've been planning a special pair of Holy Socks to celebrate Jock and Paula's ARR Craib MSA Scottish Rally Championship win in 2015 and they arrived on Friday. I think Jock likes his Holy Celebration Socks. They definitely match the car. Paula wastes no time in getting her socks on. The socks were made by Turner & Sons in Derbyshire and thanks to them for all their hard work - and perseverance! Not such a good start to the 2016 season. Jock and Paula finished 15th. after a day of snow and punctures. We hope for a better result on the Border Counties Rally which sets out from Jedburgh in March. The 2016 ARR Craib MSA Scottish Rally Championship begins on February 20th in Inverness. Last year's rally winners, Rallying with Holy Socks' Jock Armstrong and Paula Swinscoe will lead the field away in The Jurys Inn Arnold Clark Snowman Rally in the Earsman Subaru Impreza. Jock and Paula are pictured outside the Jury's Inn last year and they'll set off from there as 2015 overall Scottish Rally Champions. Showing off their Parable of the Talents Holy Socks - the pair showed plenty of talent to win the rally. "Well done, good and faithful servant." - Both of them. Size 4-7 with the single coin hidden under the turn-over top. Jock Armstrong and Paula Swinscoe are taking part in the 2015 NETWORK Q WRGB NATIONAL RALLY which begins in North Wales tomorrow (Friday). Watch out for car 202.